Filling out tax paperwork is always a hassle, especially when you come across different types of forms with similar sounding names. Here, we’ll tell you about the IRS Form W-9 and how to fill it out. You will need to fill out the IRS Form W-9 if you are an independent contractor, self-employed service provider, or a company providing services to another business entity. Based on the information you provide in this form, your customer or client will issue you a Form 1099-MISC at the end of the fiscal year. Typically, most of your customers will ask you to fill out the W-9 form. Since you probably need to submit the Form W-9 multiple times, it is better to fill it out and store it for repeated future use. 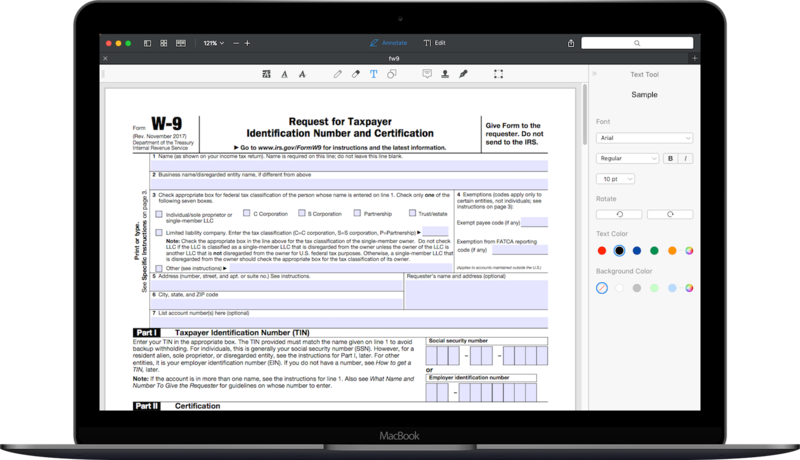 You can easily fill out the IRS form W-9 form on any iPhone, iPad or Mac using PDF Expert, the best PDF Editor for Mac an iOS. If you’re being asked to fill out the form W-9 by a customer or client, they will also likely provide you with a copy of the form. If not, you can always download the IRS Form W-9 on your Mac. 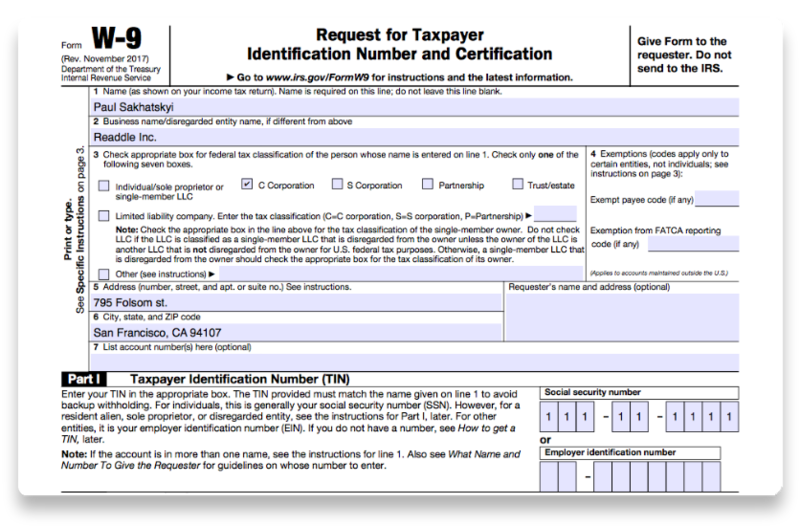 While there are several websites that host a copy of the form, we recommend downloading the W-9 form directly from the IRS website here so that you always have the latest and correct version of the form. Print out the form, sign it, add a date and send it to your customer. p.1 – Type in your name or company name exactly as it appears on your tax returns. p.2 – If you are doing business using a different name, type that name here. p.3 – Carefully read the business entity types mentioned here and select the correct checkbox corresponding to your own business. For sole proprietors select the first checkbox. Part I – Enter either SSN or EIN, for sole proprietors; they are interchangeable, so you can use either one. Store and edit your forms whenever you need them. Reuse entered information in other forms. Free full trial and affordable price if you decide to keep it. Pay once and use forever, no recurring costs of any kind. Mistakes are something we all make. However, mistakes on your tax returns can prove to be costly. Many have found this out the hard way — even a small typo in any of the fields could cost you big. We have prepared a list of common mistakes to avoid while you are filling out your Form W-9. - Mistyping your name or DBA on the W-9 can actually trigger an audit since it would appear to IRS that you didn't report your form 1099-MISC when you submit your tax return later. - Same thing may happen if you make a typo in the SSN or EIN. Remember, your customer has no way to verify that you've entered the correct details on your W-9 form. - Make sure your mailing address is correct, otherwise you will not receive your 1099-MISC form later. Keep all the forms in one place, for example in PDF Expert on your iPad. This enables a quick access whenever you need them. Once again, make sure you provide accurate information on your W-9. This will ensure that payments you receive are properly reported to the IRS. If you are unsure of some items, always consult with your financial adviser.